Bhutan, the land of the Thunder Dragon, is mystical, enchanting and like nowhere you have ever been. Voted one of the world’s top travel destinations, Bhutan remains accessible only to the privileged few. We are very priviledged to be able to organise one of the most exclusive marathons in the world in conjunction with Bhutanese Tour Operator Blue Poppy. 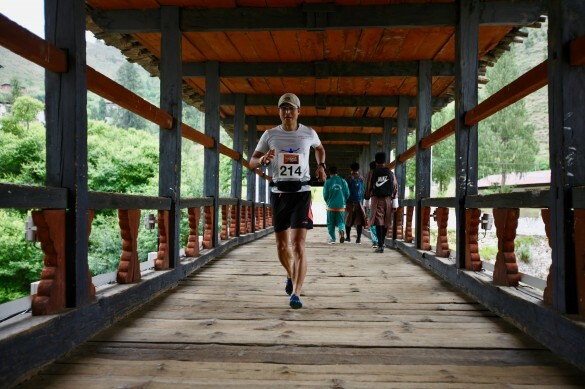 The Thunder Dragon Marathon highlights all of the aspects of Bhutan that make it so special. 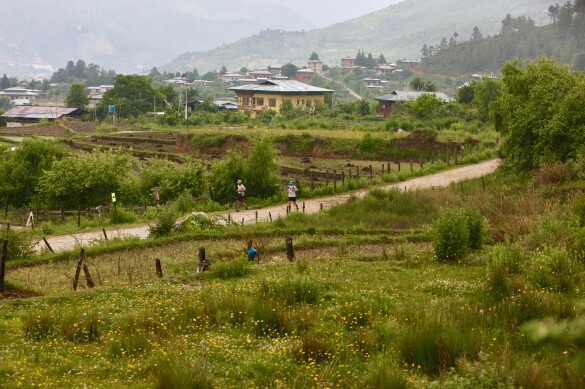 Running through the beautiful Paro Valley the route takes in fantastic scenary and passes many iconic landmarks, like the Tigers Nest Monastery, Paro Dzong and many religious Chorten - a true mountain and cultural experience. Mostly on trails and mountain paths with some road sections, the route has a number of climbs but with an altitude variation that stays between 2,200m and 2,530m there are no tremendously difficult sections although it remains a suitable challenge. From the start at Udumwara, under the cliff that the Tiger's Nest is built on, the first few kms are down hill on the road before crossing a metal bridge festooned in prayer flags. It then follows the Paro Chu River downstream where runners are at 2200m altitude. The route remains undulating along the Wang Chu tributary - going up one side for several kms, crossing a bridge and returning down the other side. Arriving back on the road near Paro you will then climb steadily up the side of a valley passing above Paro Dzong, and up to Zueray Dzong at the highest point of the race (2530m) on a 4km road climb followed by 1km up hill on single track forest trails. From here you start to drop to the valley. Crossing a beautiful wooden bridge by Paro Dzong at 31.5km, the route crosses the valley below Paro Town, once across the valley the marathon route then rises up on the road for a short distance then opens onto a wide trail from 33km to 41km, where there is an amazing section through paddy fields bringing you close to rural Bhutan before a final drop with a view of the Tigers Nest to the finish at Udumwara. The half marathon follows the marathon route to 8k before turning off to the right and making a short climb up to Paro Dzong. From here it drops back to the river and rejoins the marathon route at the wooden bridge with the final 10km on the same route as the marathon. To add on to the existing natural beauty of the resort, a traditional bridge is constructed which passes over a small brook. The resort is a blend of traditional look with a touch of modern architecture. Raven's Nest Resort has 21 guest rooms with en suite bathroom, private balcony, 42-inch cable LCD TV with premium channels, kitchenette, refrigerator, working desk and space heating. It has 8 standard rooms, 3 deluxe rooms, 2 deluxe rooms with kitchenettes, 6 junior suites and 2 villas. Bathroom amenities include shower and tub combination and rainfall showerheads. Each room is provided with bathrobes, hair dryers, slipper, hair dryers irons and ironing boards and adequate complimentary toiletries. All rooms are provided with complimentary bottled water and coffee or tea makers. We are pleased to offer a wide range of options that allow for runners to acclimatise to the altitude with long and short trips to suit your sense of adventure or the time you have available. The treks are fantastic with magnificent views of the high Himalayas and are considered moderate in difficulty reaching altitudes of 4,000 to 4,200m, or enjoy a cultural west-to-east tour by private minibus after the marathon to experience the differences across Bhutan. For those on a short time scale the 4 night tour offers enough time to acclimatise and see some of the area including the walk up to the incrdible Tigers Nest Monastery and a vist to the capital Thimphu. 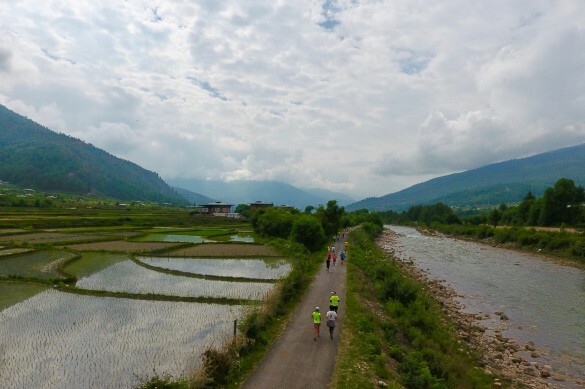 Why not make it a tour of a life time by combing our 6-night Great Wall Marathon and the 6-night Himalayan Kingdom Marathon tours and compare two great cultures, from the bustle of China to the quiet tranquility of Bhutan. We throw in a free night in a 5-star hotel in Bangkok between the two tours for those booking both together. FLIGHTS: We suggest if travelling from Europe that Etihad offer the best flighs into Kathmadu for the onward flight to Paro. In most cases you will need to overnight in Kathmandu on the outward journey as the flights to Paro are early in the morning, on the return the Paro fight arrives in Kathmandu in the early afternoon giving plenty of connection time for the departing Etihad flight from Kathmandu. Flights from Bangkok are also very early morning and we recommend staying at the Novotel at BKK International Airport, which is attached to the airport terminal. Return flights from Paro land in Bangkok in the ate afternoon and you will need to book a late evening onward fight if connecting on the same day. Get a taste of the beautiful and mystical country that is Bhutan. This long weekend option takes you to the famous Tigers Nest Monastery and a day visit to the capital city Thimphu. THURSDAY 23 MAY: Arrival from Kathmandu. Arrivals from Delhi and Bangkok are also available at a supplement. Overnight Paro. FRIDAY 24 MAY: Hike to Taktshang Monastery (Tigers Nest) 6hrs. On the way back, visit Kichu Lhakhang. Overnight Paro. SATURDAY 25 MAY: Excursion to the Capital City Thimphu (1 1/2 hr journey by coach each way). Visit the painting school, folk heritage museum, textile museum, Buddha Point, Takin Reserve. Afternoon visit to craft bazaar and weekend market. Overnight Paro. MONDAY 27 MAY: Fly out to Kathmandu, Delhi or Bangkok. A tour that captures the wide variety and rich culture of Bhutan. The Paro Valley with its surrounding pine clad mountainsides, Thimphu, the capital city of Bhutan and the Punakha Valley, a lower lying valley with a semi-tropical climate. This tour can be combined with the Great Wall Marathon by adding flights from Beijing to Bangkok with an overnight stay in Bangkok (the Airport Novotel is ideal for the stopover). TUESDAY 21 MAY: Arrival from Kathmandu. Arrivals from Delhi and Bangkok are also available at a supplement. Drive to Punakha via Dochu La Pass (approx 2 1/2hrs). Afternoon sightseeing in Punakha; visit the Devine Mad Monks Temple (Temple of Fertility) and the remarkable Punakha Dzong, past home to the King of Bhutan. Overnight Punakha. WEDNESDAY 22 MAY: Today we start our acclimatization activity with a hike to Soela Gompa via Khamsum Yuelley Namgyel Chorten. This hike is approximately 15km with a moderate level of difficulty but for some, about 5km of the initial climb will be on the difficult side. The hike will take around 8hrs. Options to return after visiting the Chorten for a shorter hike can be arranged. FRIDAY 24 MAY: Hike to Taktshang Monastery (Tigers Nest) 6hrs. On the way back, visit Kichu Lhakhang Monestary. Overnight Paro. Breakfast, lunch and dinner. SUNDAY 26 MAY: FULL & HALF MARATHONS. Early breakfast before the 8am start of both races. Celebration dinner and Cultural show at Olathang Hotel. Overnight Paro. Or make this a double Adventure with the Himalayan Kingdom Marathon - double up on a full Great Wall Marathon package with fights and we will fly you to Bangkok for 1 night in a 5-star hotel before going on to Bhutan for the 6-Night Himalayan Kingdom Marathon package. CLICK HERE FOR DETAILS OF THE GRAND TOUR. Bhutan has some of the best trekking in the world and as part of our 8-day package we offer a fully supported 4-day trek on the famous Druk (or Thunder Dragon) Trail. With much of the hike up and around 4,000m it also helps clients acclimatize for the race (which has an average altitude of 2,300m). The 8-day itinerary also takes in a visit to the famous Tigers Nest and an overnight stopover in the capital Thimphu. SUNDAY 19 MAY: Arrival from Kathmandu. Arrivals from Delhi and Bangkok also available at a supplement. Overnight Paro. MONDAY 20 MAY: Hike to Taktshang Monastery (Tigers Nest) 6hrs. On the way back, visit Kichu Lhakhang. Overnight Paro. TUESDAY 21 MAY: DRUK PATH trek – Day 1. Climb gradually upwards from the Paro Valley to the camp at 3650m. Most of the altitude gain is done today along forest trails. 20km. Climb is moderate to hard. Overnight camping. WEDNESDAY 22 MAY: DRUK PATH trek – Day 2. Leaving the camp climb steeply for 1hr and follow a ridge offering views of Mt Jomolhari if the weather is clear. A steep descent takes you to the campsite next to a beautiful lake. 15km. Overnight camping. THURSDAY 23 MAY: DRUK PATH trek – Day 3. Today is a short but tough day of ascents and descents up to 4150m. 11km. Overnight camping. FRIDAY 24 MAY: DRUK PATH trek – Day 4. The day begins with a gradual climb with possible views of Mt Gangkhar Puensum, Bhutan’s highest mountain before dropping into Thimphu on a steep descent. Visit the Takin Reserve, which is close to the finish point of the trek. Overnight Thimphu. SATURDAY 25 MAY: In Thimphu. Visit the painting school, folk heritage museum, textile museum, Buddha Point, Takin Reserve. Afternoon visit to craft bazaar and weekend market. Overnight Paro. NOTE: Flights from Bangkok and Delhi depart early in the morning to Paro and we strongly advise that you book overnight accommodation before your flight. Flights from Kathmandu to Paro, or Delhi and Bangkok for a supplement. Accommodation in choice of 3, 4 or 5-star hotels. Breakfast and dinner in hotels each day (except on trekking days), lunch in local restaurants as determined by the days itinerary. All ground transportation in Bhutan from arrival to departure in 22 seater Toyota Coaster buses or 8 seater Toyota Hiace bus. International flight to tour starting point in Kathmandu, Delhi or Bangkok. Visas for Nepal, India or Thailand. Drinks (except water on the bus). Personal items such as laundry and souvenirs. Note: BKK-PBH fights are based on flights with a touch down in India en route – this takes approx. 45mins and clients do not leave the aircraft. If indirect fights sell out direct flights will be booked with a further supplement of $60 each way. Flights into Paro are usually early in the morning so overnight stay is recommended on the inbound journey. Flights from Paro into Kathmandu arrive around lunch-time, but a long transfer time is advised for onward flights in case of delays out of Paro. Flights from Paro to Bangkok arrive in the late afternoon and over-night in Bangkok is advisable. Final balance is due 10 weeks before the trip departure.